As a plastic surgeon, many patients come to me for revision of scars. Many consider their scars as keloid. However, it is critical to make the correct diagnosis, as the treatment will vary. A wide, flat scar (will look like a stretch mark); means that as the wound was healing, there was tension on the wound. This may be due to inadequate control of tension under the skin, or due to the area of operation where natural tension exists. I have removed moles over the shoulder of many patients, and the scar has always been wider than I would have preferred, simply due to natural tension in the area. The treatment for this kind of scar is to place dermal sutures under the skin, thus minimizing the tension and to close the skin. A raised scar (may be thin or wide), means the scar is thick, but it is contained within the boundaries of the incision. This is called a hypertrophic scar. The causes can be the same as above, or perhaps due to poor wound healing from infection, inadequate blood supply, genetics and location. In my 13 years in private practice, assuming normal wound healing, I have never seen hypertrophic scars from breast augmentation with a lift. But I have seen three from abdominoplasty, and all patients were African American. The treatment can be injection of steroids into the area while the wound is in the healing process (within the first 2-6 months). Most of the time, the steroid will improve and flatten the scar. Or the scar can be excised and closed again. Silicone sheeting (medical grade silicone sheets are not sold over the counter and must be ordered through a physician), have also been used successfully. A keloid is a hypertrophic scar which grows BEYOND the boundaries of the incision. This is the critical criteria for distinction. A keloid also is histologically different than a hypertrophic scar. They are NOT the same. The treatment of keloid usually involves excision and injection of a steroid at the time of surgery. If the keloid returns after multiple excisions, radiation therapy may be an option, but has the low risk of cancer development. 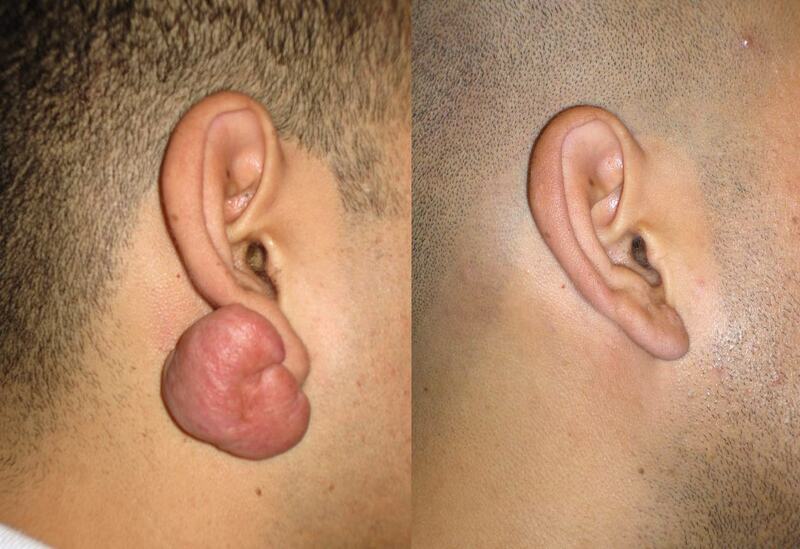 Above is a photo of an ear keloid which was treated with excision and injection of steroid. The patient is one year post surgery and the keloid has not recurred.